Honda didn’t pull any punches in the building and design of this machine, it was after all their Superbike of the time and as such the result is a perfectly ride able and usable machine. Thirty years on, most will mock the weedy brakes and flimsy chassis of the twin shock model but, looked at in context it all makes perfect sense and was after all, benchmark engineering of the time. 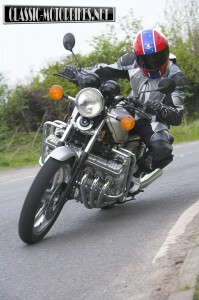 Sitting on the CBX causes mixed feelings, the engine is still visible despite the large and wide tank having a good attempt at covering it, and yet the bike feel to be well balanced and not at all the heavy weight the spec sheets suggest it to be. 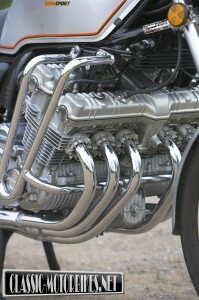 The engine itself is a work of art, with few parallels even today, some thirty years on. The double-overhead-camshaft, air-cooled unit is as compact as it was possible to make it, while being powerful, with 105bhp produced at 9000rpm, well short of the short stroke engines rev limit some 1000rpm further up the scale. Torque is plentiful too, making for a lazy ride or a speedy, revvy fast pace journey when the need takes you. As frames go this is the Copacabana beach bikini version, it fits where it touches and in all respects is a frame but everything is clearly on show with nothing left to the imagination in any way. This facet being a deliberate design feature with the idea of keeping the magnificent engine on display and unhindered by messy tube work, the effect is awesome especially when the machine is viewed in real life. No less impressive is the way the engine goes about its job, a well set up and balanced version is smooth and effortless in its operation so much so that at tickover a helmeted rider can be forgiven for continuously looking at the tacho needle for signs of life, it really is that smooth and silent. This doesn’t diminish on the move, just the whoosh of the six-into-two exhaust pipes give the game away as well as the blurry scenery and the urgency that things in the distance get thrown towards you. It is all well and good having staggering speed and acceleration but there will always come a item when the need to shed this is required, often with some urgency. It is only when a need to haul the big beats up is urgent that the bike shows its Achilles heel, the brakes, powerful and more than adequate on any other machine, really do struggle to keep the rest of the bike in check. The heat builds rapidly in the small diameter front discs and, even smaller, floating calipers, quickly overheating during repeated heavy use and fading fast too. The larger diameter rear disc, with around 14% more effective swept braking area, does help out when need be, a good dose of size 9 soon has the rear end dragging the front back a peg or two but, this isn’t instinctive to most, especially when at speed, and care does have to be used when at any kind of lean angle. 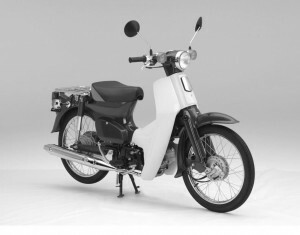 The later B model addressed this issue even though this model had stacked the pounds on even more thanks to the extensive touring bodywork and panniers, but had twin piston calipers and vented discs up front to add some extra stopping power. The forks were beefed up to suit too, 39mm air assisted units replacing the skinny 35mm legs of the Z and A models, even so the handling was little improved with the monster engine still waiting to bite the hamfisted and foolish, while complementing the skilled and more accurate rider. 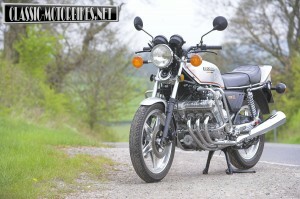 As a defining moment in 70’s motorcycle development the CBX has few equals. The look, the noise and the sheer damn cheek of it all, adds up to one of the finest machines of its generation with an endearing quality that still holds true today. The CBX, in its various guises marked a period of return to the Superbike class for Honda, having sat back on their laurels since the late 60’s, they had not developed a Superbike beyond that initial model during the next decade. During this period the other three leading oriental protagonists had stolen the march with a host of exciting and equally groundbreaking models, Honda surely had to fight back and relieve this drought. As such any new model had to be everything such a machine of the time could be, at the time of its launch it was the fastest, and most powerful production machine available. Honda had lain dormant for some time, their resources hard pressed in the pursuit of greatness in the automobile industry, because of this, the bikes were left wanting with rehash after rehash of the good old single over head cam 750–4 to act as the figure head of the world largest and arguably greatest motorcycle manufacturer. Much store was placed in the racing heritage as the multi cylinder race bikes of the 60’s and the CBX shared the same designer but, in reality the similarities were few. Just like with the World Championship winning, 250cc racers, Shoichiro Irimajiri was the project leader for the design and had a choice of prospective power plants his disposal. 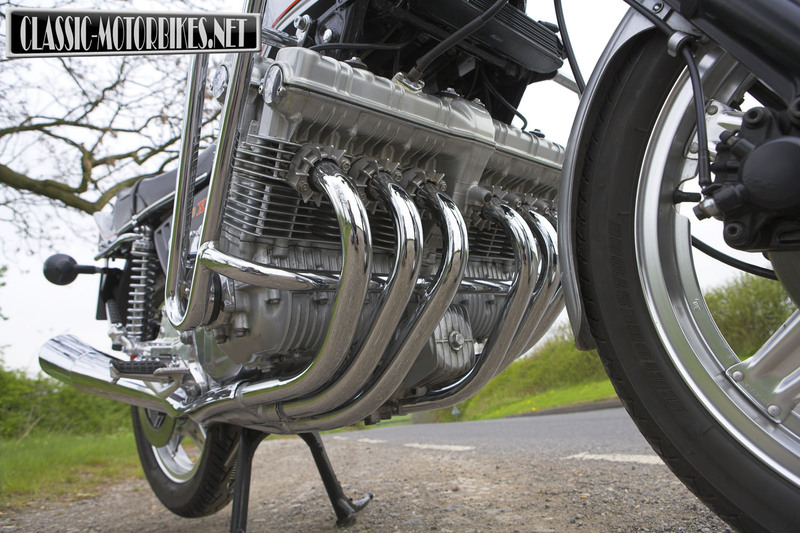 Initially development began using three different designs , two 4-cylinder prototypes, a 1000cc and a larger 1200cc powerplant and the final choice, the stunning 6-pot 1042cc, CBX. 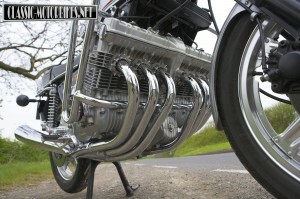 The development of the inline fours ran alongside the successful world endurance race engines of the period and, in the long run, was also time and money well spent, the lessons learned in this development led in turn to the CB900 and CB1100R models just a short while later. Just 18 months after the project began, an incredibly short time for such a radical machine but this was so due to the use of the technology and development already carried out by Irimajiri many years previously, the first machines rolled off the production line. 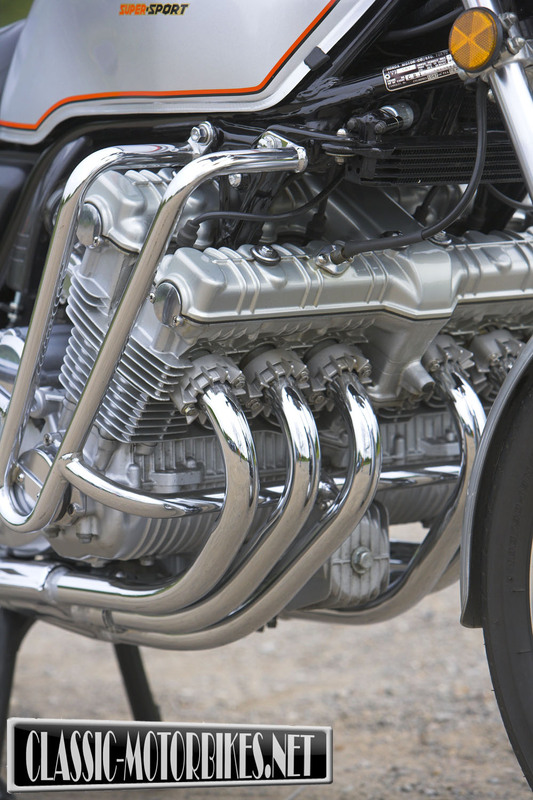 When the CBX1000Z finally emerged, few could have expected the end result as had Honda returned to its racing roots and produced both a technically advanced and daring design. 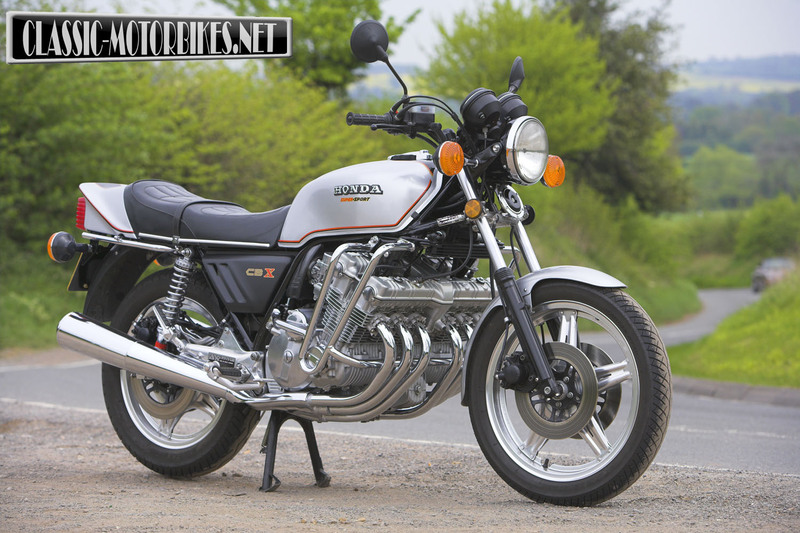 Costing a whopping £2200 back in 1979, the Honda CBX 1000Z was a good deal more expensive, around a quarter so, than any of the opposition, this price hike, allied to the huge capacity amid a world just getting used to such a thing, did the CBX no favours. Cramming so much engine into such a small place wasn’t easy but it had been achieved with great success, a basic air-cooled engine had been chosen over the more advanced liquid type simply because the lack of a radiator and the use of extensive finning heavily emphasises the engines presence within the overall package. The future as seen by Honda however, wasn’t in keeping with that visualised by the rest of the world. Where the Honda had six, the rest went with four, the Suzuki GS1000 for example, launched at the same time as the CBX in 1977 was a far better machine all round, being nearly as fast as the big Honda, even though it produced considerable less power, while also being lighter and more agile by a good margin. Superbikes would, from that moment on, get leaner, sharper and even more powerful. Honda had to respond and fast, the result being the superb CB900F model that ignored the US markets and concentrated on what the Europeans demanded and to great effect, this four-cylinder machine being based on the technology behind Honda’s successful endurance race machines, making it, arguably, the sporting machine of its time, albeit styled much like the CBX. Today the CBX enjoys a cult status with a buoyant and enthusiastic following, prices remain high, especially for original specification Z and A models, although the B onwards is considered the better ride. As a practical classic machine the CBX makes for a long legged tourer and, relatively sprightly, B road machine as well as turning heads wherever you choose to ride one. 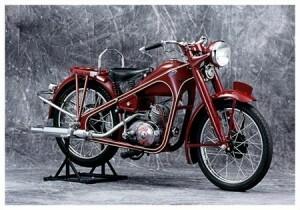 While clearly built as a showpiece for Honda technology in the world wide market place, and despite being among the first Japanese machines to be built on US soil, the type was a dismal failure stateside, prompting a U-turn in the bikes designation and consigning the design to a more staid, tourer status with the arrival of the B model in 1981. No doubt this switch in direction was the result of the staggering sales success in the US of the American built GL1000 Goldwing of 1976, the Americans showing indifference when it came to sports bikes in the 70’s. As a direct result the B received a make over and a new set of clothes, a 3/4 fairing protected the rider from the high-speed wind blast with optional luggage for those long hauls. It gained an all-new chassis too with the twin shock rear suspension of old making way for the single shock “Pro-Link” set up. The engine was tamed somewhat and power reduced by around 5bhp but, even so this model had a top speed of 127mph. The B model although perfectly capable as a machine in its own right failed when placed against others more suitable for the job of covering huge distances in complete two-wheel comfort. The BMW R series, and Hondas own Goldwing, were in a league of their own and once again the poor old CBX as left lacking with little more than that superb engine, arguably of little use on long motorway hauls, to shout about. 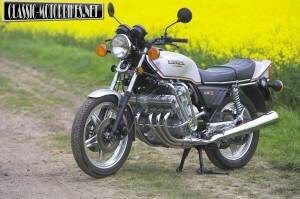 Honda launched the staggering CBX1000Z unfortunately Suzuki also revealed their thinking, the GS1000. The A model had few updates but is instantly recognisable due to its reversed Comstar wheels. The first of the Pro link B models featuring a large fairing and air assisted, 39mm forks. Engine casings were painted black. 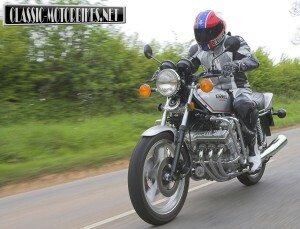 The C model marked the last of the CBX’s, virtually identical to the B but with the addition of a pillion grab rail.